Faliraki is a popular tourist destination at Rodos Island with a 5 km stretch of sand and yearly awarded with Blue Flags. At the Southern end of Faliraki beach there is an official nudist beach. Faliraki has rediscovered itself as a cosmopolitan, vibrating centre of tourism catering to many nationalities and all age groups. Faliraki boasts the largest water park in Europe, a state-of-the-art bowling park, a history park, and a fun-park for families and younger children. The centre of the town, particularly in July and August when Faliraki is buzzing with younger children and families. As well as traditional Greek cuisine there are restaurants specialising in Chinese, Mexican, Italian and British cuisine. Along the beach front there are taverns, bars, restaurants, cafeterias and tourist shops. The fishing harbour of St Apostolos is a hub of activity especially in the morning, whilst the fishing boats unload their catch, the day cruisers (direct to Lindos, Rhodes Town & beaches) depart and locals congregate for their coffee. 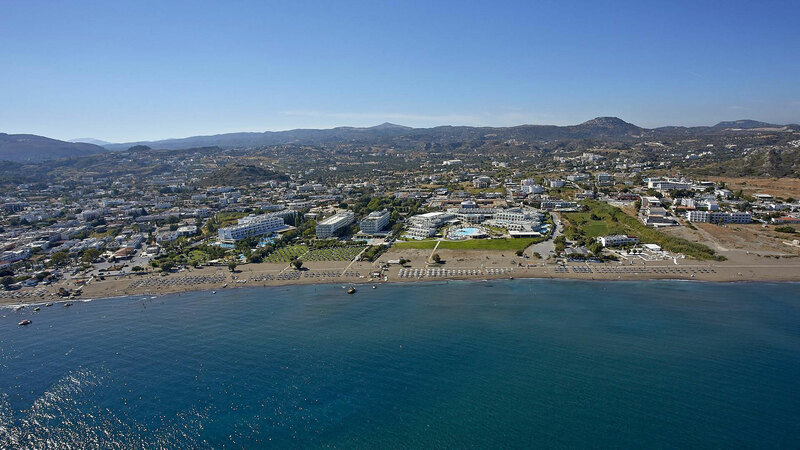 Additionally Kalithea Springs and Antony Quin Bay are located within 3 km distance from Faliraki center. Rodos island is the largest of the Dodecanese islands in Greece, in terms of both land area and population. This Greek island lies approximately 18 kilometres (11 mi) to the west of Turkey, situated between the Greek mainland and the island of Cyprus. The city has an official population of 54,000, but the actual population is estimated between 95.000 and 100.000. The city of Rodos is situated in the north-east tip of the island and forms a triangle from north to south. It is the smallest municipality of the island in terms of land area and the largest in population. It borders with the Aegean Sea in the north, the east and the west and with the municipalities of Ialysos and Kalithea where famous Faliraki is located. Historically, Rodos was famous worldwide for the Colossus of Rodos, one of the Seven Wonders of the World. The medieval Old Town of the City of Rodos has been declared a World Heritage Site. Today Rodos is a tourist destination and it is arguably one of the most wonderful islands in the world, attracting thousands of visitors each year. Rodos island has fabulous beaches ,fine weather-the best sunshine record in Greece -friendly people and fantastic scenery.